Founded in 1945, The United Nations (UN) is a collaboration of 51 countries promoting better communication concerning human rights, safety and world economics. Since 2011 193 member states have joined together to form the United Nations. 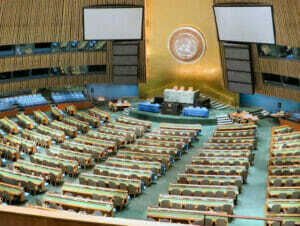 The headquarters of the UN are in New York on First Avenue, by the East River and are open to the public for visiting. 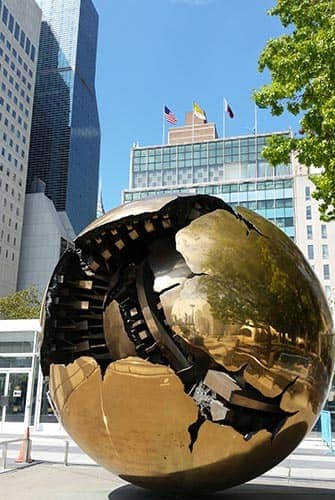 The UN headquarters is located in a special inviolable international zone belonging to all of the 193 member states. Within this zone, the UN has its own security and fire unit in addition to its own post office and administration. 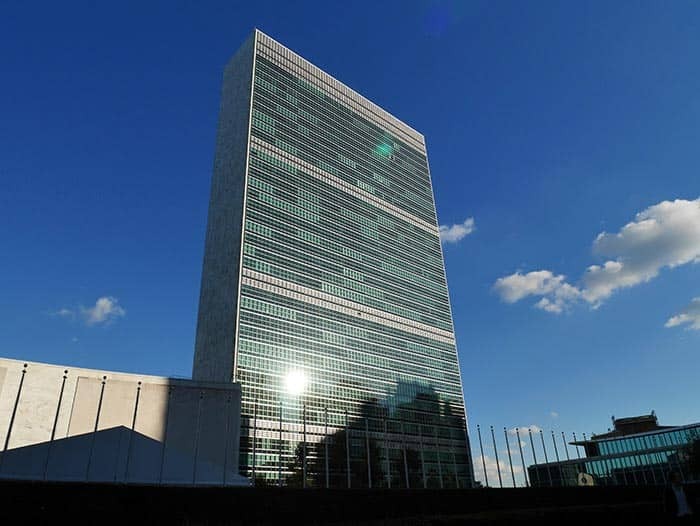 The UN headquarters consists of four buildings: the General Assembly, the Conference Center, an office complex of the Secretariat and also the Dag Hammarskjöld Library. These buildings are all designed by American architect, Wallace K. Harrison. There are 193 flags around the entire complex – as many flags as there are member states. The flagpoles, arranged in a circle equidistant from each other to symbolise the equality between the member states of the UN. The flags are also in alphabetical order; starting with Afghanistan and ending with Zimbabwe. The Visitors Center is located in the Dag Hammarskjöld Library Building (42nd Street & 1st Avenue). The visitors’ gate, is located on 46th Street at First Avenue. Before you enter, you need to collect a security pass from the Check In Office at 801 First Avenue, by 45th Street. 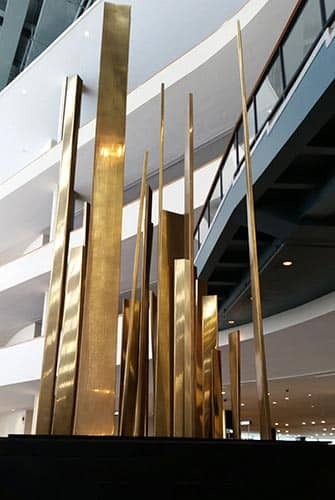 Upon entering the Visitors Center, you’ll notice all the artworks around you. All have been donated by the different members states. In the visitors lobby you can see a number of free exhibitions. There are a variety to choose from, for example photos and multimedia presentations about human rights, children in war zones, climate change etc. In the lobby, you can also find a gift shop, a book shop and a coffee shop. Go to the Visitors Center to book any tours. Eric’s Tip: The UN makes its own stamps, these can be purchased in the Visitor’s Center. It is even possible to create a stamp with your own photograph! These stamps can only be sent from within the UN zone and are very unique – a lot of visitors send letters to their loved ones with these special stamps created specially at the UN office. Guided tours are available during weekdays, they last around an hour. For security reasons, children under the age of 5 are not permitted to participate in the tour. All participants above 16 years need to bring a valid ID. All tours are wheelchair accessible. There is no coat room to store coats or bags.